Parallel legs version grants extra functionability. Crane swings on swivel wheels. Front wheels do not touch the ground when crane is not loaded. These models are easy to fold and require only a small parking space. Transport is much easier. Window to show working load at the selected position. Push button for quick change of position. 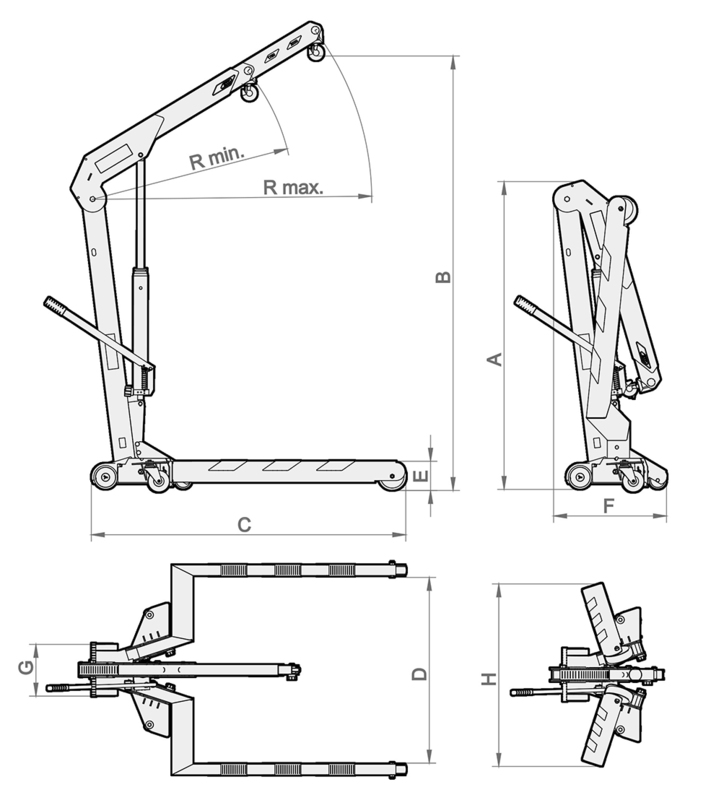 The extensible jib changes position at the pushing of a button. Patented. Swivel hydraulic unit. The pump piston spring improves operation. All models are fitted with polyamide wheels and castors to facilitate manoeuvrability. These wheels will not damage garage floors, do not rust and are quiet in operation. The extendable jib, swivel castors and hook with latch allow easy access to the load and are very manoeuvrable. The extendable jib change position at the pushing of a button. It has handle and a window to show jib position. A foot pedal facilities the in-shop handling of the crane. Rubber protections to prevent from any possible damage to the vehicle or to the crane legs. They improve visibility to prevent accidental bumping. The new positioning of the swivel wheels allows for excellent manoeuvrability. Patented.